Najmah M. Pacalna is the Lanao Team Operations Specialist for Impl. Project. She was born and raised in Iligan City and graduated from St. Michael’s College with bachelors degree in English Language. Naj has a passion for helping her community. 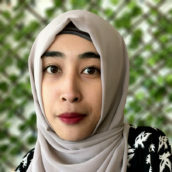 She is an enthusiastic member of our team, working in local communities in Mindanao to provide in-depth studies on the drivers of poverty, radicalization, and violence. Najmah loves visiting new towns, meeting new people, and learning different cultures and religions. She believes that learning and respecting different cultures strengthens communities and encourages diversity.